April | 2012 | the wine snob. First of all, a sincere apology. I’ve been a very bad blogger of late. I can’t believe it’s been since March 12th since I’ve written anything. You may remember I went to Vegas a few days after I wrote that post, and life has been moving at warp speed since then. First of all, we had a few weeks of summer. Where did that come from?? Can’t say I was a fan. And it really threw me off; my Rose obsession kicked in way too early, but I didn’t want to jump the gun and give in to the obsession full-force. So I felt I was in a holding pattern of sorts. There have been a ton of wines that I’ve been *this* close to sitting down and writing about, but somehow it just never happened. Se la vie. But here I sit, on my freshly cleaned patio on a gorgeous April day with the doors and windows open, after an extremely productive day off and a feeling of immense satisfaction. My hands and feet are dirty from planting herbs and a few succulents, I have dinner made and in the fridge and laundry in the dryer. And this is when it really hits me; ROSE. RoseRoseRose. Need it. Have to have it. I am owed this pleasure. Also, I am listening to Kesha on Pandora. I’d love to lie and say I’m listening to something cool and amazing like Esperanza Spalding (which I did listen to the other day), but my Kesha Pandora station has been fine-tuned after many trips to the gym, and it just makes me happy. So judge all you want, Judgey Wudgies. I’m loving it. I love that she is unapologetic in her trashiness, and that she literally goes out in public looking a hot mess and, by all appearances, high as a kite. Honey Badger don’t care. And neither do I. So there ya go- a picture of an average Monday evening at my casa. And this has all been my way of introducing you to this wine. Oh, this gorgeous wine. It was built for RIGHT. NOW. 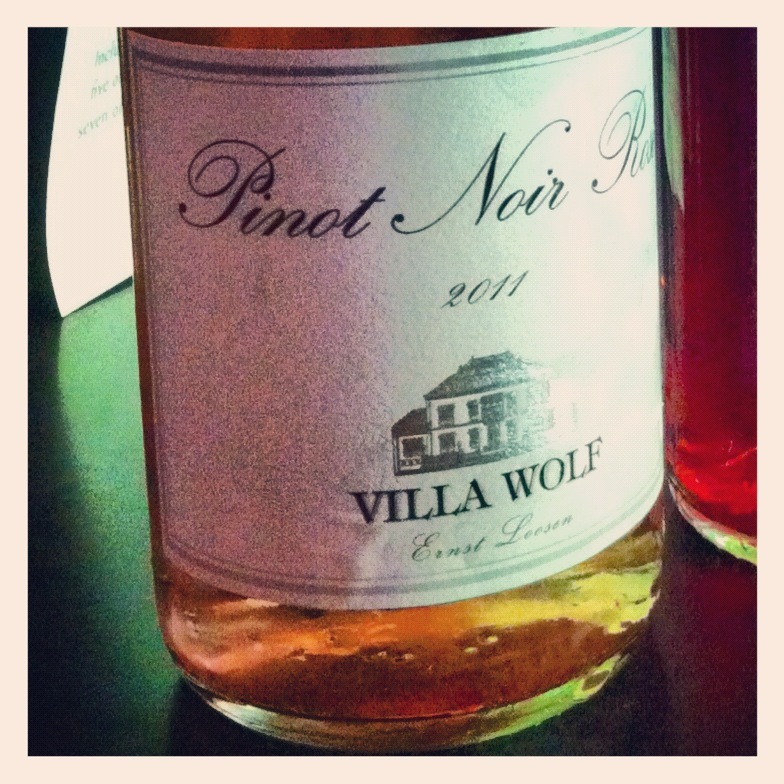 Villa Wolf Rose of Pinot Noir, 2011 vintage hails from the Pfalz region of Germany, a warm, sunny and serendipitous little place where Riesling and various other grapes like to grow. I believe Pinot Noir to be one of the only reds that does fairly well here, but I may be remiss in making that statement. In any case, this wine is made from Pinot and it’s stunning. I absolutely love a very dry Rose, but this one, while not sweet, is not supremely dry. It’s more flirty, soft, and round. But with gorgeous acidic balance, and a touch of fizz on first sip. What I look for in any Rose is quench. I want it to quench my thirst. Because Rose is really what I drink when I want to be refreshed and relaxed and rejuvenated. Which is…. kind of all the time. So, I suppose we have just narrowed down why I like Rose so much. Refresh and relax. Who doesn’t like these things? And who doesn’t want to do that right NOW, at 6pm on a Monday? Why delay gratification? Back to the wine. Soft, round, flirty- we got that far. Aromatics are owned by the berries- strawberry, raspberry, and bright cherry. A juicy yet crisp palate with hints of apple and red plum. It’s fruit, fruit, fruit and finishes with zing. That is the most succinct description I can come up with. Speaking of fruit, look what popped up on my strawberry plant recently?! I know, a strawberry! Shocking, right?! Well, the shocking thing is that this plant seems to have thrived on neglect. I haven’t watered it or done anything to it since last summer. But it has returned. So I replanted him today and vowed to care more for my plants this summer. 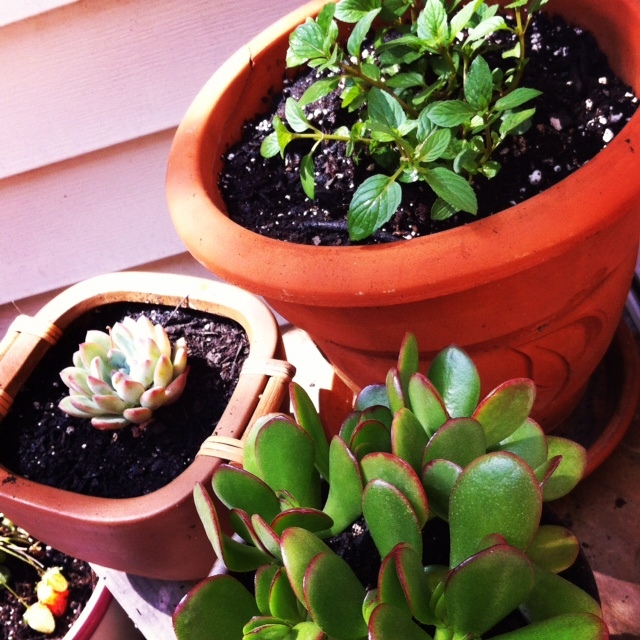 For an awfully responsible person, sometimes I shun plants after my excitement for them has worn off. Not my best personality characteristic. Maybe that’s why I’m single. Huh. Interesting. Fascinating, the things that occur to me after a bit of wine and some rambling. Some quick stats before I big you adieu; Villa Wolf is currently by the glass at Cellar, so you’re cordially invited to swing in and taste it at your convenience. You can also take a bottle home for $13. How ’bout dem apples?? Now that’s a Monday wine. Or you could stop in and see myself and the Cellar girls this Saturday (4/21) at the Wine Sale from 12-2, and have some then! Oh and PS: LAS LILAS ROSE IS BACK TOO! Oh, happy day. Also, be sure to check out Villa Wolf’s parent company, Dr. Loosen Wines- they have an active twitter feed worth a follow, too- @drloosenwines. They’ve tweeted me a few times and I feel special. Have a great week, thanks for reading, and I am strengthening my resolve to be a good (ok, better) blogger!